Bookworm1 is multi-talented. He loves books and he loves music and the imagination has kicked in gear full-force! He can make a violin out of thin air when necessary! But in this case, it wasn't necessary. Oh, please participate more than just this once! This is ADORABLE!! I fully understand the need to participate, with a great pic like that! Love the pic Carrie! He sure is a cutie! Oh, I love it! He is so adorable, and this picture is fantastic! What a great photo! Adorable! Oh, I love this photo, thank you for sharing it. 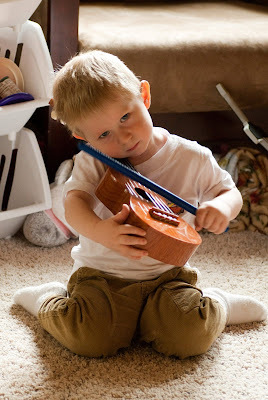 I've been trying to get my son interested in playing a musical instrument as his father plays two really well, but he's just too little to understand! How sweet! I love that he has it backwards!! But looking at how he's sitting makes my knees hurt! I love it. Too precious.